Mauro Giuliani ( July 27 , 1781 – May 8 , 1828 ) was an Italian guitarist and composer , and is reckoned by many to be one of the leading guitar virtuosos of the 19th century. Although born in Bisceglie , Giuliani's center of study was in Barletta where he moved with his brother Nicola in the first years of his life. His first instrumental training was on the cello an instrument which he never completely abandoned and he probably also studied the violin . Subsequently he devoted himself to the guitar, becoming a very skilled performer on it in a short time. The names of his teachers are unknown, and we cannot be sure of his exact movements in Italy. He married Maria Giuseppe del Monaco, and they had a child, Michael, born in Barletta in 1801. After that he was probably in Bologna and Trieste for a brief stay; by the summer of 1806, fresh from his studies of counterpoint, cello and guitar in Italy, he had moved to Vienna without his family. Here he began a relationship with a certain Fräulein Willmuth, with whom he had a daughter, Maria, in 1807 . In Vienna he became acquainted with the classical instrumental style. In 1807 Giuliani began to publish compositions in the classical style. His concert tours took him all over Europe. Everywhere he went he was acclaimed for his virtuosity and musical taste. He achieved great success and became a musical celebrity, equal to the best of the many instrumentalists and composers who were active in the Austrian capital city at the beginning of the 19th century. Giuliani defined a new role for the guitar in the context of European music. He was acquainted with the highest figures of Austrian society and with notable composers such as Rossini and Beethoven , and cooperated with the best active concert musicians in Vienna. In 1815 he appeared with the pianist Johann Nepomuk Hummel (followed later by Ignaz Moscheles ), the violinist Joseph Mayseder and the cellist Merk, in a series of chamber concerts in the botanical gardens of Schönbrunn Palace , concerts that were called the "Dukaten Concerte", after the price of the ticket, which was a ducat . This exposure gave Giuliani prominence in the musical environment of the city. Also in 1815, he was the official concert artist for the celebrations of the Congress in Vienna. Two years earlier, on the 8th of December, 1813, he had played (probably cello) in an orchestra for the first performance of Beethoven 's Seventh Symphony . In Vienna Giuliani had minor success as a composer. He worked mostly with the publisher Artaria, who published the large part of his works for guitar, but he had dealings with all the other local publishers, who spread his compositions all over Europe. He developed here a teaching reputation as well; among his numerous students were Bobrowicz and Horetzky. In 1819 Giuliani left Vienna, mainly for financial reasons: his property and bank accounts were confiscated to pay his debtors. He returned to Italy, spending time in Trieste and Venice , and finally settling in Rome . He brought with him his daughter Emilia, who was born in 1813. She was educated at the nunnery L'adorazione del Gesù from 1821 to 1826, together with Giuliani's illegitimate daughter Maria. In Rome he did not have much success; he published a few compositions and gave only one concert. In July of 1823 he began a series of frequent trips to Naples to be with his father, who was seriously ill. In the Bourbon city of Naples Giuliani would find a better reception to his guitar artistry, and there he was able to publish other works for guitar with local publishers. In 1826 he performed in Portici before Francesco I and the Bourbon court. In this time, which we could call Giuliani's Neapolitan period, he appeared frequently in duo concert with his daughter Emilia, who had become a skilled performer on the guitar. 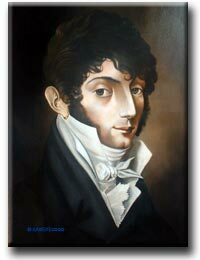 Toward the end of 1828 the health of the musician began to fail; he died in Naples on 8 May, 1829. The news of his death did not create much of a stir in the Neapolitan musical environment. Giuliani's achievements as a composer were numerous. Giuliani's 150 compositions for guitar with opus number constitute the nucleus of the nineteenth-century guitar repertory. He composed extremely challenging pieces for solo guitar as well as works for orchestra and Guitar-Violin and Guitar-Flute duos. Outstanding pieces by Giuliani include his three guitar concertos (op. 30-36 and 70); a series of six fantasias for guitar solo, op. 119-124, based on airs from Rossini operas and entitled the "Rossiniane"; several sonatas for violin and guitar and flute and guitar; a quintet , op. 65, for strings and guitar; some collections for voice and guitar, and a Grand Overture written in the Italian style. He also transcribed many symphonic works, both for solo guitar and guitar duo. One such transcription arranges the overture to The Barber of Seville by Rossini, for two guitars. There are further numerous didactic works, among which is a method for guitar that is used frequently by teachers to this day. Today, Giuliani's concertos and solo pieces are performed by professionals and still demonstrate the ability of the guitarist to play the piece, as well as Giuliani's natural ability as a composer for the classical guitar.